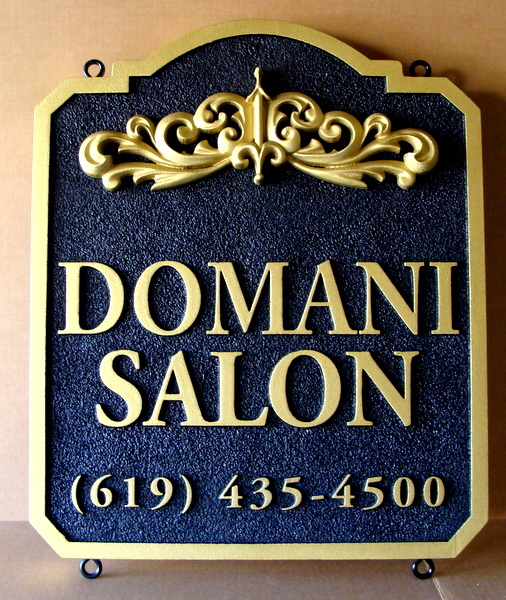 Above is a beautiful HDU "Domani" Hair Salon sign featuring a 3-D sculpture and 24K Gold-Leaf gilt. In constructing this sign the background is first lightly sandblasted to create a sandstone appearance. (HDU is a 100% waterproof material which may be used indoors or outdoors.) The sign features a 3-D carving of a decorative flourish. The lettering and borders are carved in 2.5-D raised (flat relief). After painting with bright long-lasting automotive-type enamels, and applying 24K Gold Leaf to the text, borders and artwork, this plaque is clear-coated twice, ready for outdoor use.